Special Offer from Verizon Wireless and Harris-Wireless! many deaf individuals that appreciate Deaf Art. a deaf intern at the Tamarind Art Gallery. lead to better treatment on hearing loss! - unless they interpret for the deaf-blind. whose knowledge of English is weak. on tournament games will be kicked out of the gym! HOW TO TRAP AN IMPORTANT PERSON? person, and make him listen to our requests. would decide the fate of closed captioning. New York, discussing captioning issues. casino, go gamble with him. Whose idea it was to establish the league? organizational skills helped found the league! the way of players on the field! the US national deaf tennis program. is owned by Tsutomu Miyamoto. up the hiring as something so sensational. embassy, etc). Not that so in Philippines! We all have things we won't tell other people. it is human nature. We're all equally guilty. warmed up before a classroom lecture is to begin. the store was robbed. I was pushed away by the robber. The store manager yelled at the robber that I was deaf. 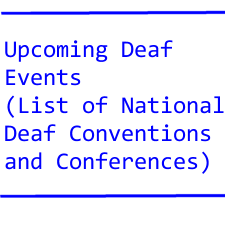 approval on papers to certify the person as deaf? deaf on credit card web sites. Union, a local semi pro baseball team to a game. The game was a sell out. 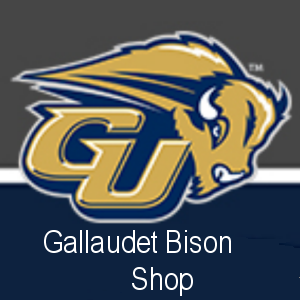 Gallaudet's share of gate proceeds - zero! on issues concerning the Internet.